Leo Nikolaevich Tolstoy was born September 9, 1828 (new style) at his family's estate, Yasnaya Polyana, in Russia. His childhood was somewhat normal, for someone of the upper class, except for the constant repetition of death in his life. The first came at age two with the death of his mother. Leo Tolstoy got along with his three older brothers, Nikolai, Sergei, and Dmitiri, and younger sister, Marya. Dmitri, being the closest in age, was Tolstoy's playmate most of his childhood but their relationship never progressed beyond boyhood games. Sergei, for Tolstoy, most closely represented his mother and his sister, Marya, later became a nun for the church. Yet it was his oldest brother Nikolai, that, Tolstoy admired. The children adopted the idea with enthusiasm and even organized a game of Ant Brothers. Boxes and chairs were converted with shawls, and they all cuddled together in the dark within the shelter. Nikolai had disclosed the Ant Brotherhood to them but not the chief secret - the means by which all men would become everlastingly happy. He had written this secret, he said, on a green stick buried by the road at the edge of a ravine in the Zakaz forest. The ideal of Ant Brothers clinging lovingly to one another, only not under two armchairs curtained by shawls, but of all the people of the world under the wide dome of heaven, has remained unaltered for me. As I then believed that there was a little green stick whereon was written something which would destroy all evil in men and give them great blessings, so I now believe that such truth exists among people and will be revealed to them and will give them what it promises. Two years before his death, Tolstoy dictated to his secretary, N.N. Gusev, the following: "Although it is a trifling matter, yet I wish to say something that I should like done after my death. Even though it is a trifle of trifles: let no ceremonies be performed in putting my body into the earth. A wooden coffin, and whoever wishes, carry it or cart it to Zakaz, opposite the ravine at the place of the 'green stick.' At least, there's a reason for selecting that and no other place." When he mentioned the green stick, Gusev observed, tears filled his eyes. At age nine his family moved to Moscow but returned each summer to Yasnaya Polyana. It was a new world for Tolstoy. Beggars on the street that no one paid attention to and serfs who didn't acknowledge, let alone bow to his father, all helped Tolstoy realize that Yasnaya Polyana was no longer the center of the world. After the family had rented a home Tolstoy's father left for Tula on business. While en route to a friends house he mysteriously "turned up dead" on the road. Because his papers and money were missing it's widely believed he was murdered by those servants that accompanied him, not unheard of at the time. Shortly afterwards Tolstoy's grandmother also passed away. Losing two family members in the same year pushed Tolstoy to ask tough questions and formulate serious ideas about death and happiness. He concluded that death could come at any time and that happiness can be obtained simply by enjoying the present. So for three days he set aside his homework and read a novel and ate ginger bread which he bought with his last kopek. He also believed that if one could learn to endure suffering they would never be unhappy. To increase his stamina for suffering he would hold a dictionary straight out in front of himself for five minutes. Another time he whipped himself until he started to cry. Needless to say both these activities were short lived. While these perceptive thoughts may seem unusual for a nine year old boy Leo Tolstoy had his share of boyish concerns. Not the least were his looks. His cauliflower nose, bushy eyebrows, and big lips convinced him he was ugly. Daily he prayed and asked God to make him as good looking as his older brother Nikolai. When that didn't work he took a pair of scissors and cut off his eyebrows only to have them grow back thicker than before. These worries only made a naturally shy Tolstoy even more self conscience. With the death of his Father and Grandmother Tolstoy and his siblings were orphans. Tolstoy moved with his aunt to Kazan and for the next four years did very little with his life. Finally his aunt convinced him to prepare for and take the university entrance exam. While religion, Arabic, French, German, and English received impressive scores his failing scores in Russian history, geography, and statistics would prevent him from passing the exam. Yet not to be discouraged by this he retook the test and passed. After passing the exam Tolstoy became excited about the prospect of university life, not academia. He liked the way he looked in his uniform and on the first day of class hoped to pass a policeman so as to be saluted, as was customary on the first day. 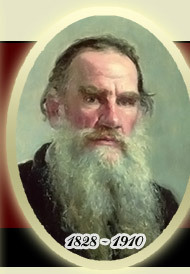 Tolstoy's perception of the way he looked continued to cause him much stress. He often complained that his clothes didn't fit the way they did on his brother Sergei. He took gymnastics in hopes of becoming "the strongest man in the world." Parties were difficult for him. He was naturally shy and would sometimes over compensated for this by being obnoxiously loud, hence the nickname "the bear." In addition he couldn't dance and the girls often commented how boring he was. The culmination of these things left Tolstoy lonely and with few close friends. He did manage to find a close friend in Dmitri Dyakov. Social, religious, and political issues were discussed on a level that provided Tolstoy with the intellectual stimulation he had long sought. Both believed that the purpose of life was to perfect oneself. For the rest of his life Tolstoy would reminisce about Dmitri and the time spent together. Tolstoy's first experience with a woman came at the nagging of his brothers. They took him to a brothel where Tolstoy began a 15 year stint of promiscuous behavior. While he shared his bed with several women, eventually contracting gonorrhea, his first experience upset him greatly. Tolstoy later told a friend, "When my brothers took me for the first time to a brothel and I accomplished this act, I then stood by the woman's bed and wept." From this point on his sexual desires and moral beliefs would constantly be at odds with each other. Of course Tolstoy kept formulating ideas. Maybe the most important at this time was the idea of perfection. Tolstoy believed one could achieve happiness if they perfected themselves morally, mentally, and physically. He often made lists of what he would do to better himself in each area. Other ideas came to him as well. He divided society into the upper and lower class and tried, unsuccessfully, to be a part of the upper class. He started formulating ideas about history, a dominant theme in War and Peace, and the worth of a university education. "History is nothing other than a collection of fables and useless trifles messed up with a mass of unnecessary dates and proper names....Why should any one have to know that the second marriage of Ivan the Terrible to the daughter of Temryuk took place on August 21, 1562, or that the fourth to Ann Alekseyevna Koltovski happened in 1572? Yet they demand that I learn all this by heart, and if I do not know it, they give me a 'one.'" "Solitude is equally beneficial for the man living in society, as society is for the man not living in it. Let a man but withdraw from society and retire into himself and his reason will soon strip off the spectacles through which he has hitherto seen everything in a corrupt light." For the next four years Tolstoy did very little. He tried to free the serfs at Yasnaya Polyana but being suspicious of his intentions they rejected his offer. He traveled to St. Petersburg for the first time and fell in love with the city. He began writing but nothing significant came of this.